Image caption Rights groups claim at least 50 people have been shot dead in days of violence. Security forces in Sudan have shot dead at least 50 people in days of protests over fuel subsidy cuts, human rights groups have said. Police fired tear gas to disperse more protesters on Friday, witnesses have told the BBC. Officials say fewer than 29 people have died, and they insist that the subsidy was unaffordable. Protesters have accused President Omar al-Bashir's government of corruption and called on him to quit. Under Omar al-Bashir, there has been little tolerance for demonstrations. These protests mark a fundamental change, however: It is clear that live ammunition is being widely used, and many people have died. The obvious conclusion - whatever one makes of the government's claim that those on the streets are criminal gangs - is that those in power are scared of being swept out of it. The reference point in Sudan is not so much the Arab Spring as the Sudanese popular revolutions in 1964 and 1985. In both, massive demonstrations led to the president being overthrown. These latest protests are a long way from that point. However there are many in Sudan who are fed up with Mr Bashir's rule and the worsening economic situation, of which the lifting of the fuel subsidies is just the latest episode. The key question now is whether the flying bullets will break the protesters' will - or provoke even more to join the crowds. The African Centre for Justice and Peace Studies and Amnesty International say people have been killed by gun shots to the chest or head, citing witnesses, relatives, doctors and journalists. A 14-year-old boy was said to be among the victims, who were mostly aged between 19 and 26, the groups said in a statement. Hundreds had been detained, they added. "Shooting to kill - including by aiming at protesters' chests and heads - is a blatant violation of the right to life, and Sudan must immediately end this violent repression by its security forces," said Lucy Freeman, Africa Deputy Director at Amnesty International. Hospital sources have told the BBC that about 60 people have been killed. Sudanese officials have not commented on the claims but Information Minister Ahmed Belal Osman said on Thursday that any death tolls higher than 29 were inaccurate. BBC Arabic's Mohammad Osman in Khartoum says that around 500 people took to the streets of Jabra, an area in the southern part of Khartoum, chanting "peaceful, peaceful" to stress their non-violent nature. Eyewitnesses have told the BBC that the security forces fired tear gas against the protestors and made several arrests. Reuters news agency reports that trucks with mounted machine guns were parked at main roads and near large mosques across Khartoum and its twin city of Omdurman ahead of Friday's protests. Our reporter says internet is still available despite reports that access has been cut for the second time in a week. The unrest began on Monday when the government lifted fuel subsidies to raise revenue. Austerity measures have recently escalated fuel prices, hitting people on low incomes. 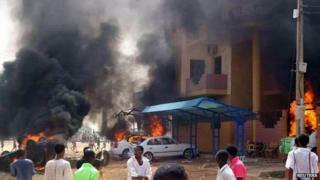 The demonstrations began south of Khartoum and have now spread to the capital and other cities. Sudan's economy has been in trouble since South Sudan ceded in 2011, taking with it 75% of the oil reserves that had fuelled an economic boom. The Sudanese government reduced some fuel subsidies in July 2012, prompting several weeks of protests and a security crackdown. Politicians, including President al-Bashir, have defended the austerity drive, saying the only alternative would be economic collapse, according to local media reports. Despite efforts to mobilise opposition activists, Sudan has not seen a wave of anti-government unrest on the scale of that experienced in neighbouring Egypt or other countries in North Africa or the Middle East. Are you in Khartoum? Have you witnessed the clashes? You can send us your experiences using the form below.